New injured pigeon..could the piji fly again? Hello, here I'm again with a new pigeon in my home, and this time I'm really worried about his future. He can't move his right wing, the vet said it's broken, but in a bad point so we don't know what we could do for him. When he is walking he tramples on his wing, so I decided to bandage it. And he screams a lot when I have to take him to clean the temporary box... what could I do? He probably is in a lot of pain and he doesn't understand that you are wanting to help. Do you have a veterinarian that can give you pain medicine that is safe for pigeons? The one I use is called metacam. Another name for it is Petcam. I doubt the pigeon will ever fly again.I also think that the sock method, of getting the wing up, maybe causing the bird some pain.The tape look much more comfortable. I have a couple with similar injuries and in each case, my veterinarian removed the wing. It's very important that a small section of the wing be left for balance purposes. If he were in my care, I would put him on an antibiotic. This pigeon was taken to the vet from other people (the one who rescued him) so I don't know what exactly the veterinary said...tomorrow it'll be holiday in this city...=( I'll try to call him, otherwise I'll go to my vet on saturady. Could I ask you why you said about antibiotc? The broken is not visible, so there isn't infection, and his mouth is really good. do you think it's better to give him the antibiotic even if he seems to be ok? Poor piji... I'm really worried about his future... he comes from the wild life, but he couldn't return... and really a few people love pigeons...The only thing that makes me happy is that he eat. If you have metacam, do use it. Do you have a dose for the other bird? Likely the same dose would be fine. Could be the vet that saw the bird didn't know much about birds. If he did, I would expect him to give metacam, antibiotcs and wrap the wing. My vet always recommends antibiotics with a break and so I take her advise. Especially if the bird is to have surgery, such as a wing amputation, the antibiotics are a good thing to be given before hand. There is no reason the bird can't have a happy life with out the bad wing. He would do okay as a companion bird or in an aviary with a mate. So do you think he could live happy the same? It's difficult judge pigeons feelings, for example, I think he has pain, but he is in silence, and doesn't show me that he's painfull. I think it's easy for caring humans, to place one's self in the place of an injured animal. This pigeon's injuries are not fatal. A pigeon's life is more simple than your life or mine. My experience is that disabled pigeon adjust very well in captivity. That's right...pigeons do not have a sound for pain. The silence is a symptom of pain. Labored breathing is another as is not moving around. I don't know what concentration of metacam you have but I think 2 drops would be okay. thanks a lot, now I feel relieved. I'll write here news. Poor pigeon, that really looks like a bad break, right from the shoulder. I agree with everything that Charis recommended, including the bandage rather than the sock, and the possibility of amputation so he can have a normal life, although he won't be able to fly. There's a good chance that break will not heal and if he keeps the wing he most likely will always trip on it and lose his balance or injure himself. Is your Metacam concentration the same as mine? Mine is 1.5mg/ml, and I usually give a pigeon one drop per day for up to 4 days. It works as a painkiller and it is also an anti-inflammatory. Antibiotics are always advised for healing fractures, even the ones that are not exposed, as there may be an infection internally, caused by the broken bone injuring the flesh. My vet has always prescribed Baytril for fractures, but it's not the only one that works. Baytril should always be given after a meal, like half an hour after he's eaten, as on an empty stomach it can make him vomit. Good luck, I hope you'll be able to get some good advice and help from your vet! Please keep us posted! And another question, where do you do the amputation if you have to choose? We were thinking about cut maybe only the hand... what do you suggest? Please help me T_T I'm worried! BUt he's more active then before, this makes me a little happy. 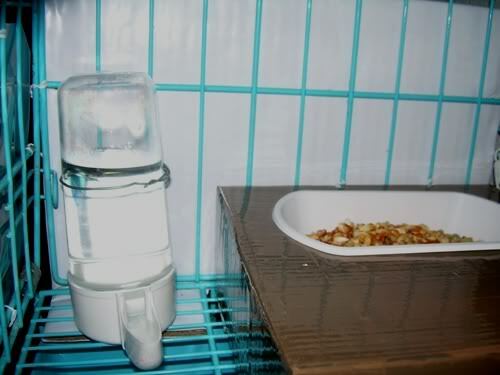 I take the piji in an other room, and I wash my hand and I don't use anything in common for both two pigeons. This was taking in my home from a girl two days ago, and she said she took this with herself for 20 days. She says she saw a bus went against him and that is the result... but I don't belive that is a bus injury... he hasn't got any wound or similar, so I don't belive that he's in this way for a bus. Oh, the good thing is that he eat and drink alone. and this is great. What do you think about? I understand your worry about the anesthesia but the wing amputation is a very quick surgery. I watched one once and it only took 10 minutes. They bring them out of the anesthesia as soon as the surgery is over and within seconds, the bird is on it's feet. If the vet has done amputations many times before on birds, I hope that will ease your mind. I've heard it said...worrying is like praying for what you don't want. As my vet explained to me, it's important to leave as much of the wing as possible because the bird will still use it for balance. I'm sure the vet will know how much to leave. As for the other bird...do try him on baytril. He may have a bacterial infection that is affecting his brain rather than PMV. If so, you will see a noticeable improvement within a few days. Do hand feed him as I think he may have a difficult time eating and he needs his strength to get well. Please don't worry about the anaesthesia, Marta, so many of mine have had it by now and there was no problem! Even little Marty, the swift, and he's only 9 cm long!!! I'm sure your little patient will be much more comfortable when he can move around without the wing tip getting in his way. I would also give the one with neurological problems an antibiotic. Salmonella can also cause those symptoms, and even if the cause is a different one, at least any secondary infection will be neutralised. He doesn't look underweight, but it's often difficult to know what's under all those feathers. Please feel his chest and see if the chest muscles feel strong, or if he's thin and you can feel the keel bone. 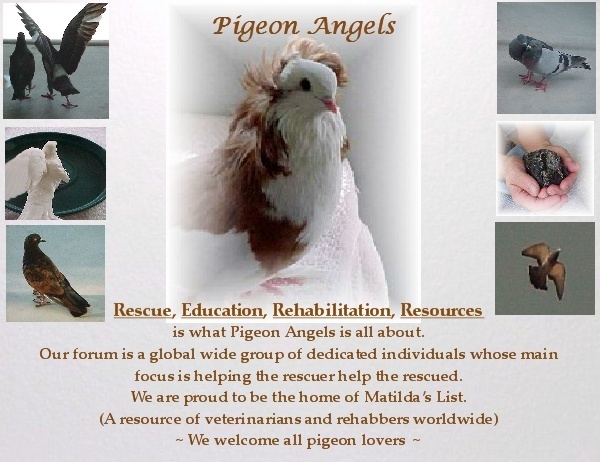 But I read in this site http://www.pigeon-aid.org.uk/pa/html/paramyxovirus__pmv_.php that : "Do not use antibiotics without consulting a vet. They can intensify the lesions and aggravate the course of the disease." Is it true? "Worrying is like praying for what you don't want" oh, this is really true. Wise words, I have to remember them. However, I'll call my vet and ask when he could do it... he does surgery in a lot of small animals such as rabbits, guine pigs, hamster and also birds, so I hope it will be all ok. If you don't feel comfortable giving him antibiotics, then do take him to the vet for a gram stain to find out if the problem is bacterial rather than viral.Avian medicine is much more complicated than most realize. It would be a shame for you to continue with him and not treat him if treating with antibiotic would cure him. Many be he does have PMV but the truth is, you don't know for sure. Many things cause those symptoms and it's not PMV. Our minds just seem to jump to the worst thing possible. Subject: Re: New injured pigeon..could the piji fly again?